Ray Williams grew up with his parents and brothers, Bill and Tom, at World`s End Cottages. Their father, and then Ray, worked for Jim Slater, at the Broadlands Farm between Ruyton and Baschurch. In due course Ray went to work for John Gittins, Hall Farm, Ruyton XI Towns. Ray seems to have been an unusual young man, and rather than spend his time playing football and drinking in Ruyton`s three pubs, he trained his body to perform formidable feats of strength which he demonstrated to his workmates on the farm. Then, he started to perform in the local pubs and at village fetes to raise money for charity. In 1971 he aimed to beat the world record for eating cheese, supplied by Ruyton dairy, but had to give up after 14 ounces! One evening he put away 8 portions of fish and chips, supplied by Roy Penton`s fish and chip van. At this time Ray`s chosen charity was for the blind, both his brothers lost their sight. 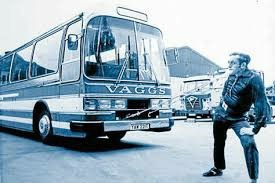 In 1974 Ray entered a talent contest in Chirk and from then on he just kept on inventing new stunts, such as pulling a bus with a rope held in his teeth, and pulling a Land Rover the same way - for 26 miles! One of his more dangerous `tricks` was balancing two sledgehammers on his teeth and he would ask a big strong man to swing a sledge at his stomach to show the strength of his muscles. Perhaps his strangest stunt was to push a pea with his nose round and round Pride Hill Centre. Unfortunately, Ray was somewhat lacking in charisma and never had a manager who could organise the publicity he deserved. In 1980 he joined the circus and toured Cornwall for the summer. He obviously had very happy memories of his childhood at World`s End, perhaps he was a particular favourite of childless Jim and Maud Fox. When Jim and Maud left Rose Cottage and moved to a bungalow at Birch Grove, Ray would visit them and that is when he met their niece, Edna, who was already suffering from Multiple Sclerosis and in a wheelchair. Ray and Edna, were by then in their 40s but they fell in love and were married in 1984. Edna was the making of Ray, at last he had found someone who needed him, someone with whom he could share his life. Although Edna`s illness got progressively worse, for 23 years, Ray, Edna and the wheelchair got dressed up for their annual performance in the annual Shifnal Carnival. Ray walked 1000 miles in 30 days round the roads of Shifnal pushing Edna in her wheelchair and in 2002 he ran the London Marathon in his wellies. He took 12 hours to complete a tri-marathon when he ran, cycled and walked 26 miles. Ray was often seen speed walking round Ruyton, walking faster than some of the modern joggers!. Every year as Edna got more and more frail, Ray attended to her every need and of course, he was able to lift her wherever she needed to be. He really never recovered after he lost her, when he became ill himself he used to say he could cope with his prostate cancer but not with the sciatica, perhaps induced by the stresses he put on his body over so many years. Ray Williams, Ruyton`s `Willpower` Strongman, went to join Edna on 26 July 2015 - Ruyton`s only celebrity.